Tasting new oil. The color is difficult to capture, it is greener than in the picture. Olive harvest, November 2017. This tree looks ready with both green and dark fruit on it. Pressing new oil is the highlight of late fall. With the seasonal ingredients becoming more substantial and dense, olives still carry the bright flavor of summer in them. Growing on a south-facing slope next to our house, our olives are usually harvested in November, depending on when they are ripe enough but not too. All olives are green when the fruit begins to develop. And all olives will eventually turn dark if left on the tree. So to get green table olives, you harvest early. For oil, you usually want some color change to occur, but if you are aiming for the freshest possible taste, you do not want to wait for too long. And when it is time to harvest, you have to be quick. Olives go to press the same day they are picked and when the season is on, mills operate day and night. The pressing process is very simple. When the olives get crushed in the press, oil comes out and is separated from the remaining fruit mass. And then you are in heaven for a couple of days. The first week with new oil is divine. The taste is so bright and fresh, a little peppery but not overly so, that you not just want to have oil all the time, you want to have nothing but the oil. You could live on it. This is the time of the year we buy fluffy white bread. 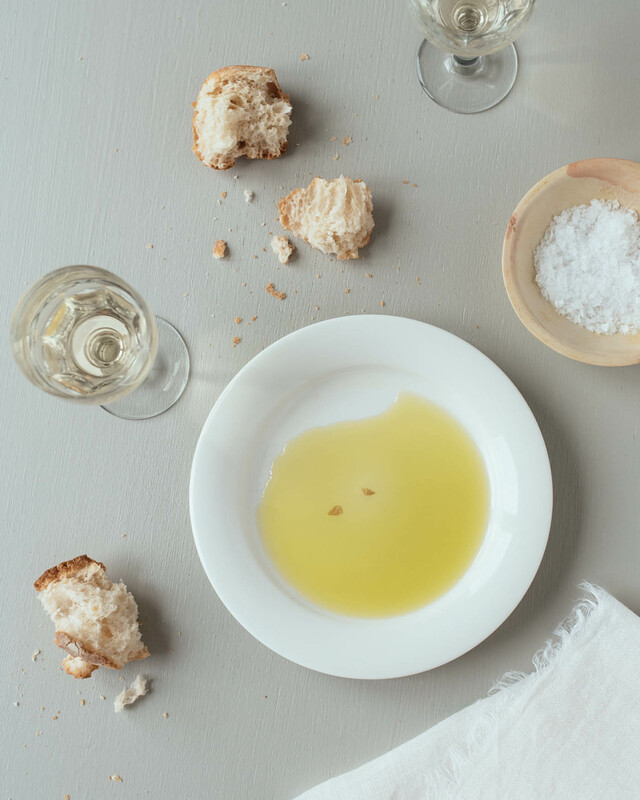 Small bread slices or chunks are the perfect tool for distributing oil from a plate to your mouth. Alternatively, you can use little gem lettuce leaves as you tasting spoon. People often ask if the oil we make is virgin or extra virgin or something else. The terminology can be a little hazy yet you can tell by tasting if an oil is good or not. Good olive oil is cold-pressed and it is what comes out when you press fresh ripe olives for the first time. You can call it oil, or you can call it extra virgin, or whatever label you want to give it. But that is how good oil is made. After the first cold press, you can get more out of the olive mass if you are greedy. But not without chemicals and heat. The taste of fresh, cold-pressed olive oil is very distinctive. If I had to pick one word to describe it, I would say green. Packed with antioxidants and life force, you want to eat it fresh, so you make vegetable soups and salads you can sprinkle it on, and go for pasta recipes that rely on unheated olive oil. As for the remaining oil from the previous year, you can make soap out of it, and nothing goes to waste. To buy good oil in a city, try a store focused on Mediterranean delicacies and ask for new oil. It should arrive by November, December. 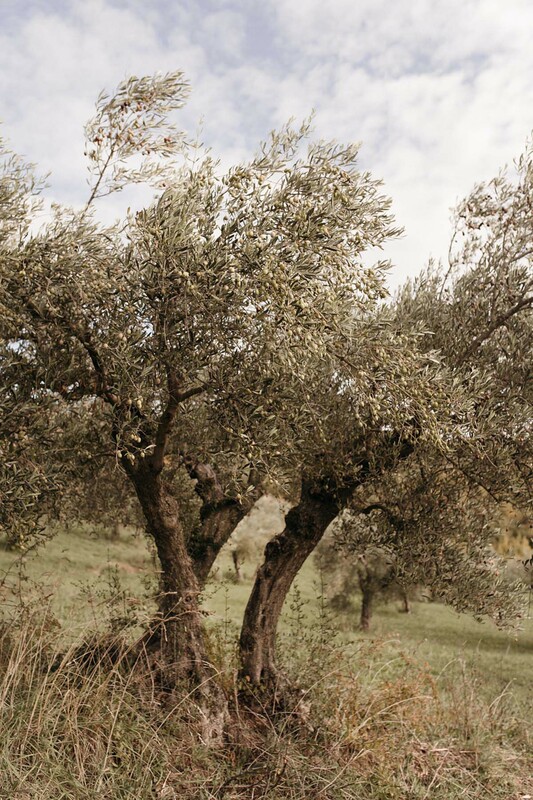 In Italy, the most elegant olive oils are generally produced in the mid regions of the country, such as Umbria and Toscana where the plants have grown for centuries and the soil and climate is just right. All oil oxidizes fast in daylight. That is why it is often sold in stainless steel containers, or dark glass bottles. Store your oil in a cool dark place and you will enjoy it longer.